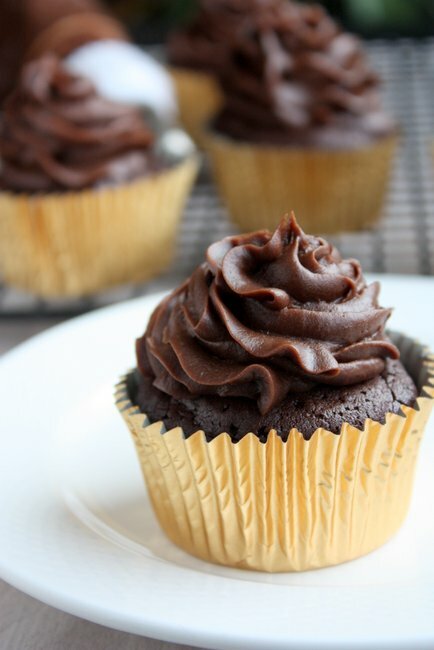 Gluten-free cupcakes: FINALLY! I’ve been wanting a recipe for gluten-free cupcakes for a while now, but by gluten-free I really mean flourless (or almond flour), since I don’t care to learn the intricacies of gluten-free flour mixing. It seems, well, complicated. One of my favorite gluten-free desserts is this flourless chocolate torte, but I didn’t think it would translate well to cupcakes. After doing some hunting, I found a recipe from Kate From Scratch — it looked like a great place to start! 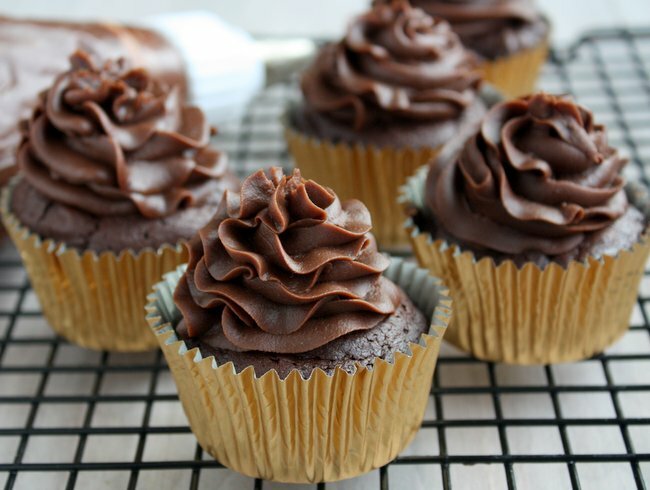 A few tweaks, and here we are with my flourless chocolate cupcakes. These are dense, chocolatey, and more cake-like than any flourless dessert I’ve ever made (as opposed to gooey/fudgelike). They were fabulous! Throw on some frosting, and you have a pretty darn delicious dessert. If you’re dairy free too, just substitute your butter replacement (I like smart balance) and it should work just fine! Whisk in the brown sugar and salt, then eggs, until smooth. For frosting, combine the cream cheese and butter together in a stand mixer. Mix until fully incorporated, light, and fluffy. Add the cocoa powder, then powdered sugar and vanilla extract. Beat until smooth, then divide evenly among cupcakes. These look marvelous! Just wondering though- approximately how many cupcakes does this recipe make? Not very many – I think I got 8 out of one recipe… and mine weren’t as big as they could have been. Luckily, it’s easy to double! Yum, your cupcakes look so good! I made these for Valentine’s day and they were amazing! I followed the directions exactly and they were rich and decadent. Not dry nor crumbly but very intense and rich which is exactly what I was going for. For those that had trouble, check your egg sizes! Small eggs won’t cut it. And I also made these with milk chocolate and they were really good. Follow directions and they work! I made a double batch of these but they only made a small bakers dozen. I mixed by hand until smooth, but they still fell. Hopefully they taste good. The frosting is delicious at least. Oh no! Sorry to hear they fell! Were you using an odd sized pan, or change anything? I’m sure they’ll still taste good, just not be quite as pretty! Do you think the espresso powder is a must I don’t have any on hand? Did you do a 1/2 tbsp or 1/2 tsp of baking soda? I followed the directions, but these just didn’t work out for me. They were very dry and the flavour was too strong. OK, that’s what it needed…the frosting. I used Earth Balance LF margarine and Tofutti cream cream alternative. I am lactose and gluten intolerant. 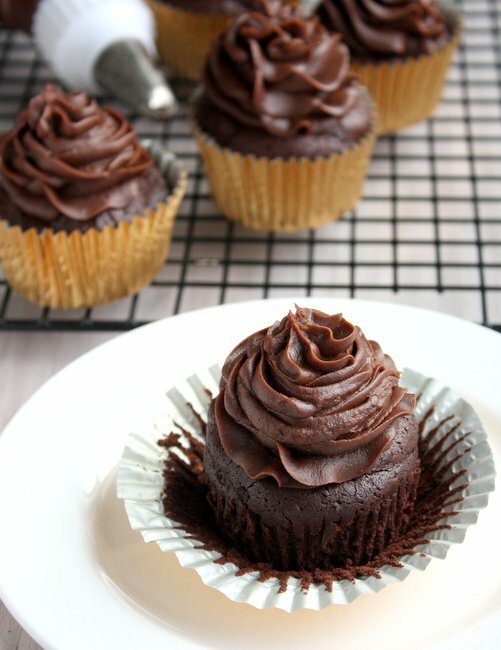 If the cake is dry, underbake the cupcakes a little or cook a a slightly lower temperature. I need this chocolate fix! Thanks for tweaking the recipe so I can enjoy chocolate again! I’m glad you liked it! I don’t think I ever tried one without frosting (whoops! ), so I’m glad to have that feedback! Thanks! With the cream cheese frosting, do you keep the cupcakes refrigerated? Or are they ok sitting at room temperature? Thanks! Hmm I am terrible with this kind if thing, and would probably keep them at room temp, but suppose you SHOULD keep them in the fridge! These are just INCREDIBLE tasting!!! Thank you so much! Thanks, Samantha! I’m glad you liked them! Any idea what the calorie count is for the flourless chocolate cupcakes? Hi Sandra – I haven’t calculated the nutrition for this recipe. I’m sure you can easily find a site to plug in the recipe and get the info! How important do you think the espresso powder is in this recipie-is it something I can forgo if I have everything else? Trying to avoid a trip to the store…Thanks! You can definitely skip it! It’s really just for enhancing the chocolate flavor! Hi Mary- these look great- just wondering, what kind of brown sugar did you use? sugar in the raw? light brown sugar? dark brown sugar? Thanks, Bonnie! I hope you enjoy them! Check out my gluten free category… I have tons of recipe for you! I’ve made twice with a vanilla bean buttercream! So delicious, although they are very, very crumbly. I already use extra large eggs. Do you have any ideas for what I could do so they aren’t falling apart? Maybe add an extra egg? Otherwise the taste is absolutely delicious. Mine are quite crumbly too, and I’ve never given much thought to the solution! Perhaps I should! An extra egg sounds like a great idea… Let me know if you try, and how it works out! Next time I have an oven I’ll give it a go, too! Thanks, Hope! I’m glad you liked it! This made 17 cupcakes, which was plenty for just me! 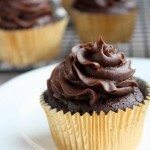 I used dark chocolate and they tastes gorgeous, more like brownies than cupcakes but lovely non the less! As lovely as they tasted, brownie like which is to be expected, they were flat 🙁 any ideas what I could do? Add baking powder?? Thanks as making them for a friends birthday tomorrow. Sorry to hear they went flat on you, Sue! I follow the recipe to a T every time and never have an issue, so I’m not sure how to advise you! I don’t keep them in the oven for 10 minutes after the first 15, but I don’t think that would make them fall (if anything it’d make them dry). Sorry I don’t have a solution for you! Good luck! I made these cupcakes and they were delicious but the frosting was more like a glaze. Thanks for the tip, Chelsie! These were amazing!! I made them for my daughter’s birthday, and I have been asked for the recipe by a few people as a result! I left out the espresso powder, and they were still very rich and tasty! Thanks for sharing!! These were great! They had a bit of a cake texture. I maybe didn’t bake mine long enough, as they were still gooey. But that’s the way I like them. Definitely a keeper. Thank you for this wonderful recipe. They came out delicious, but flat in shape. Any reason why? Hi Anat! They are quite dense — did you fill up the cupcake liners enough? Other than that, I’m not sure what could have gone wrong!